We have looked at consciousness in a variety of ways to this point. First from a basic analogy of what consciousness is like, to a general description of levels and what they are like. The last post looked at consciousness from an evolutionary perspective. We are now going to look at more specific consciousness levels. To my knowledge there is only one comprehensive map of consciousness, or list of descriptive consciousness levels. This can be extremely beneficial for giving us a more detailed view of the various levels. 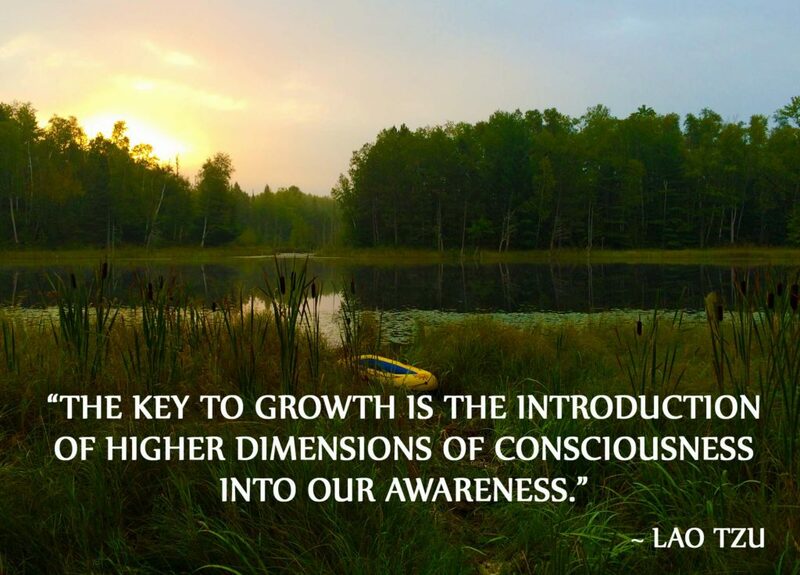 As you study these levels you may gain insight into where you stand in your own evolution of consciousness and gain a better understanding in how to move higher. Throughout history the goal of all great religions has concerned itself with techniques and teachings for rising up through these consciousness levels. Most who have done so can attest to the difficulty of this endeavor. Success depends on having a teacher or a set of teachings to guide one in this process. Just exposing oneself to this information is enough to raise one’s level of consciousness. You will notice these levels correlate with specific processes of consciousness as they relate to emotions, perceptions and attitudes towards world views, spirituality and oneself. 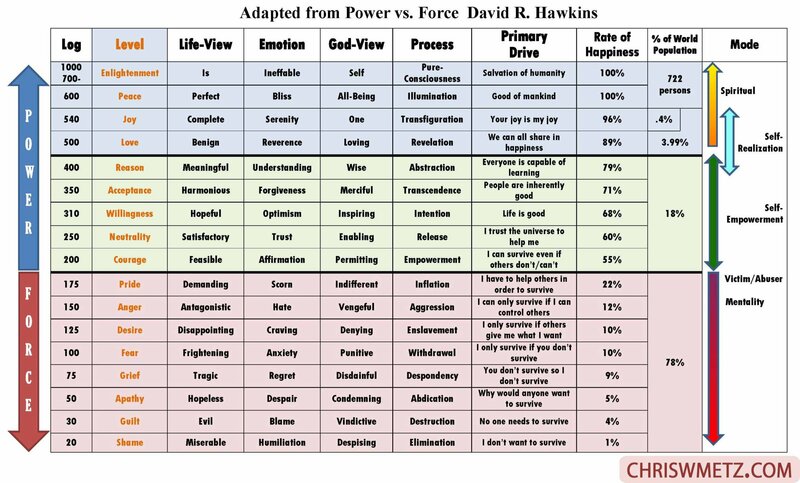 Dr. David R Hawkins 1927–2012 (Bio can be found here: https://veritaspub.com/dr-hawkins/) developed one of the most comprehensive maps introduced in his 1994 book entitled “Power vs Force.” Dr. Hawkins has written many books on the subject of how to attain higher consciousness. I have read several of his books and have numerous audio recordings of his lectures. His teachings and work resonate with me both intellectually and spiritually. I caution anyone about following any single doctrine, method or procedure as a sole basis of advancing ones personal growth. Everything should be looked at in totality for a thorough understanding of any subject. With that being said, I will highlight the “Map Of Consciousness” as a basic framework for understanding consciousness levels. I personally believe Dr. Hawkins was a very enlightened individual, but anyone who wishes to teach spiritual principles can sometimes drag up a little ego to do so. One of the most important things to note on this scale are the demarcation levels of 200 and 500. Beyond consciousness levels of 540 there is a spiritual pursuit for the attainment of enlightenment. If one attains enlightenment, the very act of achieving it increases the overall consciousness of humanity. The level of 400 (Reason) with its intellectual fact based logic is a major hurdle to entering the more spiritual levels of 500 and above. Beyond 540 is the pursuit of the spiritual requiring some faith. This is precisely why enlightenment is typically known as “Spiritual Enlightenment.” The intellectual will have a hard time getting over a pure fact based scientific approach to life. These people tend to remain fixed below the 500 level as a result. When or under what conditions have you felt weakness? When or under what conditions have you felt a sense of personal power? What are the qualities, characteristics, traits or principles of the people you feel that possess as sense of personal power? What are the qualities, characteristics, traits or principles of the people you feel are weak or are unable to influence others? Can you see how people have a tendency of “taking a trip” through the lower levels at the loss of a loved one, substantial trauma or other substantial loss during life? In the next post we will go into detail describing each level in Dr. David R. Hawkins Map of Consciousness. To go there now click here. This entry was posted in Calming The Mind Within, Enlightenment, Self Awareness, Spirituality and tagged consciousness, Personal Growth, self-awareness, thoughts, victim mentality. Bookmark the permalink.